So we're now well and truly into 2018 and I'm sure I'm not the only one who's excited for the year ahead?! Maybe you got engaged over the Christmas period, or you're on the final count down to your big day? This blog post is about trends coming up in 2018, so even if you're at the start of your planning or well on your way to being finished, this should help with inspiration or for those final touches. So make a cuppa, sit back and have a read! So we've been doing our dessert bars now for a few years and it seems they are just going to become even more popular! We were one of the first in the North East to offer desserts bars and we're super proud of the selection we now offer, from our very popular Gin and Tonic cheese cakes, to the fabulous and personal stationery provided by Silver Birch Designs. We can cater for any occasion, any theme and have even been able to do a walking dead theme, complete with zombies! So it seems the naked cake trend isn't going anywhere fast, still as popular as ever in 2018. However, now there's more ways to make the cake unique to you, with personal touches in toppers, flowers making a huge statement or even adding some metallic with edible gold leaf. We've noticed more couples are opting for the semi naked look, adding in extra layers to add height and drips to make the cake look completely irresistible. This Christmas we've really enjoyed the elegant designs we've had. Going into the New Year our couples are definitely opting for elegant designs, with marbling being a huge trend over the coming year, this coupled with ruffles make for a stunning show piece. We love our flowers here at Sara's Kitchen and I'm so excited to see what some of my florist friends have in store for this next year. Floral hanging installations are meant to be huge, with hanging wreaths, arches and huge statements pieces. Be bold and go large, with beautiful trailing details... here's a stunning bouquet from the amazing Peony and Gold. So that's my take on what will be huge in 2018, what do you think, is there anything you'd like to see? 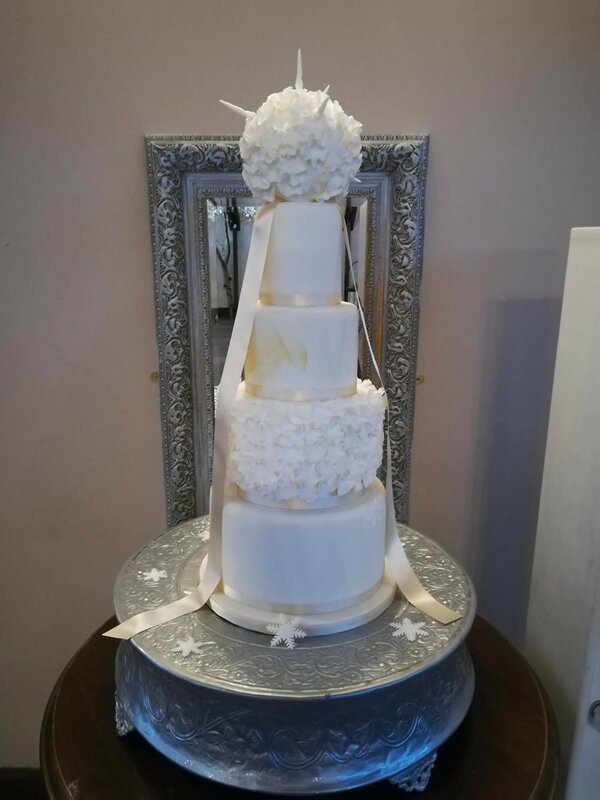 We're now working on some gorgeous new display cakes for our fayres over the coming months. Our first event of the year will be at As You Like It this Saturday, closely followed by South Causey Inn, so make sure you pop along and see what new designs we have and of course sample some tasty treats! Happy New Year to you all and hope to see you soon! Images on from a variety of amazing photographers, I've listed them below! Stationery - As I'm sure you all know I work in a studio alongside the fabulous Janette from Silver Birch and we use her for all our stationery needs including our dessert bar menus, pictured above! Finally we've featured a few venues, I've tried my best to tag them all but sorry if I've missed anyone!